Therapy of small fiber neuropathy (SFN) includes two strategies: (1) treat the underlying etiology and (2) symptomatic treatment, in particular for neuropathic pain. If a cause for a SFN is identified, the management will focus on treatment of the underlying disease. 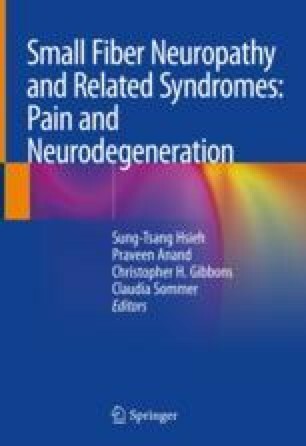 However, in the setting of neuropathic pain, symptomatic therapy may be required independent of the underlying disease. There are many medications and topical agents that can be used for relief of pain from neuropathy based on various levels of evidence including many randomized clinical trials. However, the evidence for neuropathic pain treatment is usually derived from trials designed for neuropathy (both large and small fiber), but is not specific for SFN. Therefore, the recommendations can only provide some general guidance on treatment of pain in SFN. Major classes of medications used to control neuropathic pain are antidepressants, antiepileptics, opioid (and opioid-like) medications, and topical agents. The selection of agents to treat neuropathic pain in SFN is based on several factors such as mechanism of action of the drug, the presumed mechanism of the pain, the patient’s comorbidities, the medication’s side effect profile, and the possible drug-drug interactions. Therefore, the choice of a particular therapy to treat neuropathic pain in SFN is a decision made by both the treating physician and the patient to achieve a realistic goal of pain relief.